This museum was a pleasant surprise. It’s not Dayton or DC, but there’s a very nice collection of planes here. Inside is the South Dakota Aviation Hall of Fame, including barnstormer and airmail pilot Nellie Zabel Willhite, who didn’t let being deaf stop her from being a pilot and joining The Ninety-Nines. Also, there’s the funny story of Bismarck the dog, who learned how to ride the buses and get beer and whiskey from the bars in Rapid City. If Bismarck sat in a booth, the bartender would bring him beer in a bowl. If he climbed up on a stool at the bar, they would bring him whiskey. He chased the wimmen, too. I’ve been on vacation for a week with no internet connection *shudder*, so pardon me while I catch up. You get to see some of my vacation pictures (which always reminds me of the Night Gallery episode “Hell’s Bells). The Minuteman Missile National Historic Site is one of the newest in the park service. There’s actually three separate sites – the launch control center, one of the missile silos, and a temporary museum, all just east of Wall, South Dakota along Interstate 90. We did the right thing by calling ahead, because we found out that a retired missilier volunteers his time one day a week and gives tours of the launch control center. The park ranger was extremely nice, but there’s nothing like hearing the story from one who lived it in the 1970’s at the height of the Cold War. Minuteman Missile on display at the South Dakota Air and Space Museum, Ellsworth AFB. Lockheed Martin Corp. (LMT)’s first 63 F-35 fighter jets are exceeding their combined target cost by $1 billion, showing the Pentagon’s costliest program lacks a reliable design and efficient manufacturing, according to U.S. congressional auditors. The Pentagon is absorbing $672 million and Lockheed Martin the remaining $328 million in added costs for the aircraft in the first four production contracts, the Government Accountability Office said in prepared testimony today for a House Armed Services Committee hearing on tactical aviation. 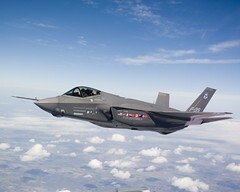 The committee is conducting the first oversight hearing on the F-35 Joint Strike Fighter for the fiscal 2013 budget. “The long-stated intent that the Joint Strike Fighter would deliver an affordable, highly common fifth-generation aircraft that could be acquired in large numbers could be in question,” Michael Sullivan, the GAO’s director of acquisition management, said in the statement. The testimony previews the GAO’s annual report on the Defense Department’s most costly weapons program, which is to be published next month. The GAO’s findings and the Pentagon’s annual test report, issued in January, are the two primary sources that lawmakers and the public have for assessing the military’s and Lockheed Martin claims for the F-35. The reports are also closely watched by the program’s eight international partners, including Canada, the United Kingdom, Italy, Australia and Norway. The GAO’s quote there is spot on. If this fifth-generation fighter is too expensive, nobody will care if it meets mission. Partner nations will drop out by the end of the year at this rate. What’s worse is we’ve seen this movie before. And we know all about the crying at the end. As the US public became increasingly weary of the seemingly unending US involvement in Vietnam, the Nixon administration negotiated with the North Vietnamese to secure an exit from the war without throwing our South Vietnamese allies to the wolves. Negotiations had been mostly fruitless for a long time. The North Vietnamese knew time was on their side and sought to drag the negotiations out as long as possible, with the eye to either achieving their goals on the battlefield, or through concessions at the negotiating table. The NVA first tried to achieve military victory with their Easter Offensive begun on March 30, 1972. Ironically, after years of training, organizing and equipping both our forces, and the Army of the Republic of Vietnam (ARVN) as a counter-insurgency force, we faced what was in effect a conventional army in a conventional offensive action. It is quite likely only the prompt application of massive US airpower that stemmed the tide of this assault. First, tactical US airpower supported friendly forces on the ground. Secondly, US forces began the first sustained air campaign against North Vietnam since President Johnson had suspended Rolling Thunder in 1968. Operation Linebacker was a large scale interdiction effort designed to interrupt the NVA’s ability to supply its armies in their offensive. For the first time in the war, B-52 bombers were sent against targets in North Vietnam. But there were still restrictions. The B-52s were only used in the southern parts of North Vietnam. The Rules of Engagement may have been far more lax than under the Johnson era, but they were still quite a number of targets that were off limits. The areas of Hanoi and Haiphong (the port serving Hanoi) were off limits to the big bombers. Still, Linebacker was a successful campaign. With the failure of the NVA offensive, the North Vietnamese began for the first time to seriously negotiate. By the late fall of 1972, the US and North Vietnam had reached a consensus on what a cease fire would look like. The problem was, the South Vietnamese government wasn’t directly involved in the talks. When the US presented the framework to the South Vietnamese government, they balked. When the US went back to the table to modify the agreement, the North Vietnamese walked out. President Nixon was faced with a crisis. The next US Congress would be enter session on the 3rd of January, 1973. It was quite likely that if there was no signed peace agreement, the Congress would simply cut off funds for our efforts in Vietnam, in effect, ending our involvement by the power of the purse. The NVA would then not be constrained by any agreement whatsoever. Nixon was increasingly desperate to pressure the North into signing the agreement. Frustrated by the North’s intransigence, he turned to airpower to sway them. A massive aerial assault on North Vietnam would be unleashed. And for the first time, the B-52s of SAC would be going downtown. Hanoi and Haiphong would be their destination. Over 200 B-52s, based in Thailand and at Guam, would be assigned to the campaign, in addition to the hundreds of Air Force and Navy tactical aircraft available. There were two models of B-52 available. The older B-52D model was optimized for the conventional high altitude strike mission. With most responsibility for the nuclear role removed, it’s bomb bays had been modified to carry larger numbers of conventional 500lb bombs. Between the bomb bays and the external wing racks, a B-52D could carry 108 five hundred pound bombs. Further, having been used in Southeast Asia for years, their electronic warfare systems were optimized to counter the Vietnamese SA-2 missile system, with extremely powerful jammers. The other bomber available, the B-52G was the first of the Stratofortresses that had been designed with the low level nuclear strike mission in mind. And since it still had that primary nuclear strike role, it had not been modified to carry larger internal bomb loads, nor were its jammers optimized for the SA-2. In a low level mode, a more nuanced approach to jamming would be taken. But the enormous numbers of anti-aircraft artillery guns in North Vietnam dictated that they would have to use a high level approach, just as the B-52D models would. Their less powerful jammers would leave them somewhat more vulnerable to SAM fire. Air operations against North Vietnam were the responsibility of the 7th Air Force. Navy aircraft came under the aegis of Commander, Task Force 77, reporting to the Commander, US Pacific Command. But the B-52s all belonged to the Strategic Air Command at Offutt Air Force Base in Nebraska. This lack of unified command would have consequences. 7th AF, under the direction of the White House, designated targets, and coordinated with TF77. But the actual planning of mission for the B-52s was directed by SAC. The senior leadership of SAC had spent 30 years planning a campaign against the Soviet Union. But they had little practical experience with the air defense network of North Vietnam. SAC was concerned more with North Vietnamese fighters than the Surface to Air Missiles (SAM). During the first Linebacker operations, North Vietnamese fighters had been very aggressive, and SAC was convinced they would be the primary threat. But that ignored the extensive losses the North had incurred during those operations. President Nixon initially authorized a three day campaign, dubbed Operation Linebacker II, to begin on 18 December, 1972. SAC’s orders led to the use of “corridor” tactics, in which a stream of bombers would approach the target by the same route and altitude, while escorts laid down chaff, Wild Weasels suppressed SAMs, electronic warfare planes jammed radars, and fighters covered them from North Vietnamese interceptors. With only three days strikes authorized, SAC pressed for a maximum effort, with 129 bombers launched on the first night. The primary targets that night were airfields that housed the MiGs of the North. The problem with the corridor tactic was that it took a long time to get that many bombers over the various targets. Losses on the first night were three B-52s, roughly 2.5% of the force, heavy, but acceptable. The problem is, you can’t remain predictable in war without the enemy finding an effective counter to your operations. The second night saw 93 bombers over North Vietnam. Only about 20 SAMs were launched, less than a third of the previous night, and no bombers were lost. SAC was sure its tactics were vindicated. But the North Vietnamese quickly adapted. On the third night, 99 bombers went after power plants, rail yards, and petroleum storage sites. And it was a bloodbath. The North Vietnamese knew when and where the strike was coming. With only 34 SAM launches, they shot down eight B-52s, four G models, and four D models (one of these four managed to limp to Laos before it crashed). An 8% loss rate, even with the massive support from tactical aircraft, was simply unacceptable. SAC was stunned. But the crews were not. From the moment the first strike planning had come down from on high, they had railed against what they saw as outdated, unimaginative planning. Mission planning from people half a world away from the conflict, with little or no experience in the theater of operations, had the crews livid. Time and again, they begged to be allowed to plan their own missions. Time and again, SAC rebuffed their pleas. Nixon extended the operation beyond the initial three day authorization. SAC, reacting to the heavy losses of the previous night, grounded the Guam based bombers. Only the Thailand based B-52D models, those best equipped with jammers, would go north. The greatly reduced numbers of bombers would shorten the time needed to hold open a corridor. But SAC still insisted on the same tactics that had proved disastrous the night before. Of 30 bombers that went over North Vietnam that night, two were shot down, a 6% loss rate. That was still far too heavy. Losses that high would mean that in only a few more days, the heart of SAC’s bomber force would be gutted. Losses of aircraft and personnel were bad enough. But from SAC’s perspective, the loss of prestige was even worse. If they couldn’t defeat the North Vietnamese, the entire premise of strategic bombing would be called into question. 7th Air Force, controlling the tactical aircraft in theater, did what it could to help. Its F-111 all weather strike aircraft were pulled off interdiction targets, and instead directed against airfield, and more importantly, against SAM sites that had played merry hell with the bombers. By closely coordinating the timing of these F-111 strikes, they could ensure the SAMs most likely to interfere with the bombers were too busy defending themselves to do anything else. Further, strikes in the Hanoi area were curtailed. Instead, targets in the slightly less defended Haiphong area were struck. Missions on the 22nd, 23rd, and 24th of December, numbering about 60 aircraft each, saw no losses from the bomber force. An errant string of bombs on the 22nd struck a hospital near a petroleum storage site (and not far from an airfield) causing a furor, but operations continued. But bombing around the periphery of Hanoi wasn’t going to force the North Vietnamese back to the negotiating table. Almost every worthwhile target was in the Hanoi metropolitan area. The campaign stood down for Christmas. But operations would resume on the night of the 26th. And changes to the tactics were in hand. SAC, having presided over the disastrous losses earlier in the campaign, finally released local B-52 commanders to plan the missions they would execute. Importantly also, the Guam B-52s had been hurriedly modified with extra jammers to allow them to operate over North Vietnam again. The raid on the 26th was a massive one. 120 B-52s, supported by 113 tactical aircraft headed north. Most infrastructure targets had been pummeled so the attacks concentrated on the air defense system. SAM sites, radar sites, and airfields would bear the brunt of the attack. More importantly, corridor tactics had been abandoned. Rather than streams of bombers flying in file down a highway in the sky, several raids would converge from all around the compass, at different altitudes, all at the same time. In 20 minutes, the raid would come, bomb, and leave. The North Vietnamese, accustomed to the previous tactics, were unable to cope with the sudden onslaught of so many aircraft at once, from so many directions. One B-52 was lost over the target, and one crashed on return to Thailand, for a far more acceptable loss rate of 1.6%. A 60 plane raid the next night also saw the loss of two bombers, a 3.2% rate, heavy, but acceptable. The last two nights of raids were both of 60 aircraft each. No losses were incurred among the bombers. On the last night, in addition to the 60 bombers up north, 30 G models conducted “Arc Light” missions further south. After the 29th of December, the raids were suspended. The raids were stopped for two reasons. First, the North Vietnamese had agreed to return to the negotiating table. Secondly, there were few remunerative targets left for the bombers to strike. Contrary to popular belief, the B-52s weren’t just laying a carpet of bombs across all of North Vietnam. Instead, great pains were taken to only strike militarily significant installations and infrastructure. North Vietnam was such a backwards nation, there just weren’t a lot of those targets. With the end of Linebacker II, and with Nixon’s message to the South that the agreement would be signed, with their blessings or over their objections, a cease fire was signed. The air campaign against North Vietnam was over. For over 8 years, the US had conducted a campaign marked by indecisiveness, micromanagement, a deeply flawed understanding of the enemy, and an inability to properly plan and execute a decisive air campaign. The political issues surrounding the campaign and its effects are outside the scope of our discussion, but the Air Force certainly learned a number of lessons about how to plan and execute a decisive campaign. Less than 20 years later, the Air Force would find itself pitted again against a complex, integrated air defense system. And it would prevail in a matter of weeks, not years. Still, not all lessons gleaned were correct. The disastrous attempts to put entire squadrons of early F-16s over Baghdad early in Desert Storm showed that learning is a continuing process. It’s is impossible to know if a Linebacker II style campaign early in the war would have achieved the same goals as it did in 1972. But it is clear that the North Vietnamese were deeply impressed with the campaign when it did come. I knew cutting $487 billion dollars out of the defense budget was boneheaded, shortsighted, pick your adjective, but now it’s personal. The DoD Space Test Program (STP) is on the chopping block. Without the STP, I know a couple dozen research and development experiments would never have gotten off the ground. I know of millions of dollars in benefits to both NASA and DoD programs that came from these experiments, and who knows what for classified missions. They handled the transition through the end of the Shuttle era and had been working with all the resupply vehicles and the commercial cargo carriers to keep science on ISS going. They have had some kind of science experiment on every ISS expedition going back to September 2000. And it will end on September 30, 2013 as the budget stands now. Grumble! We mentioned in the comments on an earlier post that we like our airplanes a little ugly (but not our women!). Here’s a slightly ugly one for you- The Chase/Fairchild C-123 Provider. Never heard of it? You’ve almost certainly seen it. It starred in three movies that I can think of off the top of my head: Con Air, Air America, and Operation Dumbo Drop. Right after World War II, the Army Air Forces were looking to replace the obsolete Waco CG-4A gliders used during the war. A greater cargo capacity was needed to transport heavier artillery and anti-armor weapons for airborne troops. While the AAF in the main suspected that air drop of heavy equipment would be feasible using the new C-119 cargo plane, they hedged their bets and asked for bids for a large assault glider. Chase Aircraft answered the call with the CG-20. Two prototypes were built in 1948. One was tested and flown as a glider, but it quickly became apparent that any field that would allow the glider to safely land would be big enough for a powered aircraft to land, and take off again, for that matter. And the CG-20 would be far to expensive to be used as a disposable asset the way the CG-4A was. * Since the CG-20 had been designed with a powered version in mind, both prototypes were used to evaluate different powerplants. One, the XC-123, had two Pratt&Whitney R-2800 engines, and became the prototype for the C-123 series. The other became the XC-123A, and was powered by four J47 jet engines in pods, incidentally becoming the first USAF jet transport. The jet version didn’t offer very good performance, but the piston powered XC-123 was ordered into production, with minor improvements, as the C-123B. Chase Aircraft designed the aircraft, but because of limited production capability, and for political reasons, Fairchild Aircraft was awarded the production contract, and just over 300 C-123Bs were built. By adding an improved landing gear, and adding two J85 jet engines to improve takeoff performance, about 180 Providers were upgraded to the C-123K configuration. C-123Ks would provide logistical support to bases throughout the war zone during the entire duration of the conflict. There was always a shortage of C-130s in Vietnam, and C-123s had lend a helping hand. A handful would soldier on until the late 1970s or early 1980s with the Air Force Reserve and Air National Guard. In fact, my cousin made his first jump at Airborne school in 1979 from a C-123K. The other widely known C-123 mission was rather infamous. Under a program known as Ranch Hand, modified UC-123s were equipped with aerial spraying equipment and applied Agent Orange over large swaths of South Vietnam as a defoliant. The reasoning was, if the VC were hiding in the jungle, remove the jungle and kill the VC. First, it later came out that Agent Orange was a significant carcinogen. Secondly, can you imagine the outrage of the environmental lobby today if the US pursued large scale defoliation as a national policy today? Some C-123s were also modified into a wide variety of other special configurations. A couple were modified as flare ships, dropping flares to provide illumination to friendly forces on the ground, or for AC-47 and AC-119 gunships. Two were highly modified to act as night time snoopers over the Ho Chi Minh trail, equipped with night vision systems, thermal imagers, and even cluster bomb dispensers. Redesignated NC-123K, and later AC-123K, they were apparently not entirely successful, as they were only used for a couple months, and no further conversions were undertaken. A handful of other aircraft were used by Taiwan, on behalf of the CIA, in a role that hinted at the MC-130 Combat Talon mission. Modified with special self protection jamming and terrain following radar, these “Black Cat” C-123s transported special operations and clandestine agent forces deep into North Vietnam, Laos, and Cambodia. One suspects that the selection of the C-123 for several of these missions wasn’t so much because the Provider was the best platform, but because there were a fair number of them around, and no one was going to really miss them if they were lost. The C-123 was rather freely distributed to our allies, primarily in Southeast Asia. The US Coast Guard also operated it as a long range search and rescue platform, until it was replaced in that role by the HC-130H. A handful of C-123s are in private hands, and still in use as cargo aircraft. One Thai C-123 was converted to turboprop powerplants. Consider this, the Provider, in one form or another, has flown as a glider, a piston powered aircraft, a hybrid with piston and jet power, a turboprop, and as a pure jet transport. Can you think of any other aircraft with that record? *yes, I know, in the CBI, CG-4As were extensively reused by snatching them back into the air, but in Europe, they were generally a one shot proposition in combat. Spartan Shenanigans, Or how the C-27J program is history repeating itself. Way back in October, Craig posted about the Army’s CV-2/C-7 Caribou fleet and how the Air Force took that program away just as it was proving its worth in Vietnam. Fast forward forty years, to 2005. The Army, dissatisfied with Air Force airlift inside theaters of operations (especially Iraq and Afghanistan, but to some extent also in places like South America), decided to open a competition for a Light Cargo Aircraft, or LCA. They eventually selected the L-3/Alenia C-27J Spartan. The C-27J Spartan is an modernized version of the Alenia G.222 short haul airlifter. The basic G.222 airframe has been updated with the modern Rolls Royce AE2100 engines with improved six-bladed props, giving it greater fuel efficiency and a higher cruise speed. The avionics have also been updated to modern “glass cockpit” standards. The Army was pretty pleased. Big enough to carry a useful load, capable of airdropping personnel and supplies, and yet small enough to operate right up to the front lines, the Spartan was just the thing to replace the Army’s aging fleet of C-23 Sherpas, C-26 Metroliners, and some C-12 Hurons. It would also ease some of the strain on the CH-47 Chinook fleet, freeing those critical assets to support those places that couldn’t be serviced by fixed wing aircraft. So far, so good. But right about the time the Army started making progress on this major acquisition program, the then Chief of Staff of the Air Force, GEN T. Michael Moseley, announced that hey! the Air Force also wanted to start a competition for a new light cargo plane. Not surprisingly, their requirements were awfully similar to the Army’s. And not surprisingly, in a cost-saving measure, the DoD directed the services to combine the competition and seek procurement of one type of aircraft. The Joint Cargo Aircraft was born, and it was something of a given that the C-27J would be selected. It was, and in 2007, a $2 billion dollar contract for 78 planes was signed. Deliveries began the next year. Of the first contract for 78 aircraft, 40 were supposed to go to the Army (actually, various Army National Guard units) and the remainder to the Air Force (again, actually to various Air National Guard units). But almost immediately, the Air Force began lobbying for control of the entire fleet, under the rationale that a single manager made more sense. The Army struggled to maintain control of its slice of the program, but in 2009 lost, and the Air Force gained control of the entire program. Not only did they seize control of the program, the promptly cut the buy to 38 aircraft. Later, the contract was trimmed again to 21 aircraft. The Air Force story was they would make up the shortfall by more closely integrating C-130 operations to support the Army. Now comes news the Air Force is considering terminating the program early. Only 13 aircraft have been delivered so far. Alenia has scrapped plans to build a final assembly plant here in the US. So once again, the Army, who had hoped to buy as many as 125 Spartans, gets hosed by the Air Force. The Army and the Air Force look at the in-theater airlift mission from different perspectives. The Air Force is into centralized planning and control. From the Air Forces earliest days, they learned the lesson that the greatest way to leverage airpower’s inherent flexibility is to operate under centralized control. With limited airlifters, and global airlift responsibilities, centralized planning for airlift makes sense. Every AF airlift mission is tasked and monitored at Scott AFB, in Illinois (Hi, Phat!). But the Army isn’t concerned about worldwide airlift. Theater commanders (and their deputies for logistics) are more concerned with having an asset at hand that can fulfill mission critical/time critical airlift right now in support of ground forces. The operational paradigm is likely different as well. Rather than deploying a squadron of airlifters to theater for six months, individual airlifters would deploy on specific mission sets, being tasked via Scott AFB in response to requests from within the theater, and eventually returning home. The Army, on the other hand, would likely activate a National Guard battalion of Spartans, deploy them in theater for six months to a year, ride ‘em hard and put ‘em away wet, and then redeploy the battalion stateside, to be replaced by another battalion in rotation. That way, there would be a half dozen or so airlifters on scene to handle any “hot potatoes” that crop up. Differences in operational philosophies aside, it’s been clear for several years the Air Force has been acting in bad faith from the start. Every step of the way, they’ve shown their entire purpose in involving themselves in the C-27J program has been calculated means of denying the Army access to the aircraft. Shame of the Air Force. Author XBradTC2Posted on January 14, 2012 Categories Afghanistan, Air Force, army, planesTags air force, army, planes12 Comments on Spartan Shenanigans, Or how the C-27J program is history repeating itself. As World War II loomed, the importance of airpower at the tactical level was forefront in the minds of many folks in our Army. The Blitzkrieg through the Low Countries and France only served to reinforce this school of thought. Accordingly, the Army and the Army Air Forces sought ways to improve US airpower. In many theaters, such as North Africa and especially in the Pacific, the land campaign would serve largely as a means of advancing airfields. But unlike today, there just weren’t a lot of airfields anywhere. If the Army Air Forces wanted an airfield, chances were, they would have to build one from scratch. The trouble was, AAF didn’t have any capability to build airfields. Enter the Engineers. The Engineers were in a bit of an odd position during the war. Historically considered one of the Combat Arms, during World War II, they were reclassified instead as one of the services. But it wasn’t as simple as that. The wide range of engineering duties in the war meant Engineer units were to serve with the Army Ground Forces (AGF), the Army Service Forces (ASF), and with the Army Air Forces. The engineers serving with the AAF were generally assigned to Aviation Engineer Battalions (AEB). An AEB was a relatively small battalion, primarily tasked with construction duties. Lavishly equipped with construction equipment such as graders, sheepsfoot rollers, bulldozes and scrapers. Dozens of AEBs were activated for service in every theater of the war, and they built hundreds of airfields. The most obvious task in building an airfield is, of course, the runway. After grading an appropriate strip, many had Pierced Steel Planking overlaid to help support the heavier weights of aircraft, especially in areas with lots of rain. But a runway does not a combat airfield make. There were plenty more engineering tasks besides that. Parking and dispersal areas, maintenance areas, bomb dumps, fuel dumps, housing and messing facilities for the aviators, drainage and sewerage for the field, and improvements to local defenses were also prime tasks. An operational airfield might be build in just a matter of days. The AEBs also repaired damage to airfields from enemy air raids, and provided limited local defense against ground attack (there’s that secondary infantry role again). Finally, when they weren’t actively building airfields, the AEBs were used by theater commanders to improve infrastructure. Often this meant building roads from port facilities to airfields. After the war, when the Air Force gained its independence, it no longer had call upon Army Engineers. The introduction of high performance jet aircraft made the role of AEBs seem superfluous. But experience in Vietnam showed that there was still a role for deployable engineering forces beyond the normal housekeeping capabilities of most Air Force Wings. Accordingly, the Air Force in 1966 activated the first RED HORSE squadrons. Rapid Engineer Deployable Heavy Operational Repair Squadron Engineers initially provided repairs to airfields damaged by VC attacks in Vietnam, but have since proven invaluable during expeditionary operations in the Post Cold War era. When the Air Force deployed huge numbers of aircraft to Saudi Arabia during Desert Storm, the problem became,where to put them? The Saudi regime had built quite a few bare bones airfields. Consisting of little more than a large runway and ramp space, these airfields were swarmed by RED HORSE squadrons and quickly developed into airfields capable of supporting operations. Similarly, airfields in Iraq, Afghanistan and several other of the ‘stans have been improved by RED HORSE to support operations in the War on Terror. Leon from The H2 sends us this link. Mrs. Leon is involved in this project. “We Stand Ready” – nice!